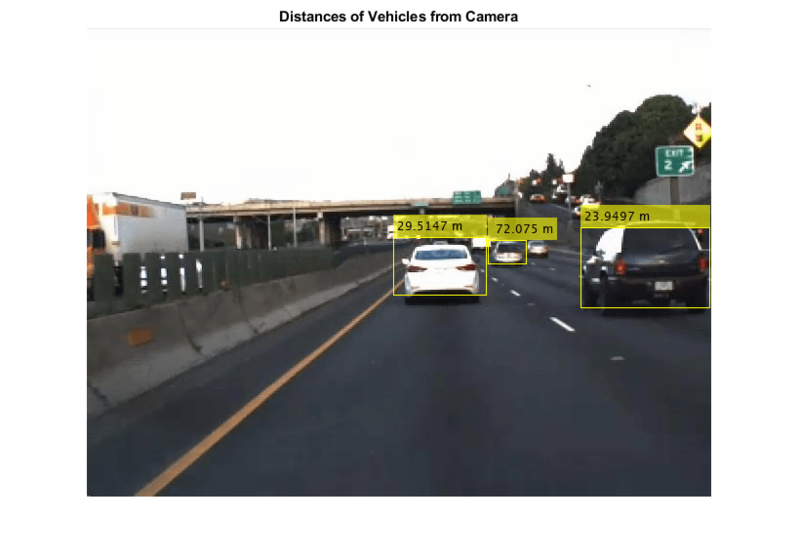 Develop a computer vision algorithm to detect vehicles in a video, and use the monocular camera configuration to estimate distances to the detected vehicles. Use the AutomationAlgorithm API to create an automation algorithm. See Create Automation Algorithm for Labeling (Computer Vision Toolbox) for details. The created automation algorithm can be used with the Ground Truth Labeler app to automatically label vehicles, along with attributes to store the estimated distances. Good ground truth data is crucial for developing driving algorithms and evaluating their performances. However, creating a rich and diverse set of annotated driving data requires significant effort. The Ground Truth Labeler app makes this process efficient. You can use this app as a fully manual labeling tool to mark vehicle bounding boxes, lane boundaries, and other objects of interest for an automated driving system. You can also manually specify attributes of the labeled objects. However, manual labeling requires a significant amount of time and resources. As an alternative, this app provides a framework for creating algorithms to extend and automate the labeling process. You can use the algorithms you create to quickly label entire data sets, automatically annotate the labels with attributes, and then follow it up with a more efficient, shorter manual verification step. You can also edit the results of the automation step to account for challenging scenarios that the automation algorithm might have missed. This example describes how to insert a vehicle detection and distance estimation automation algorithm into the automation workflow of the app. 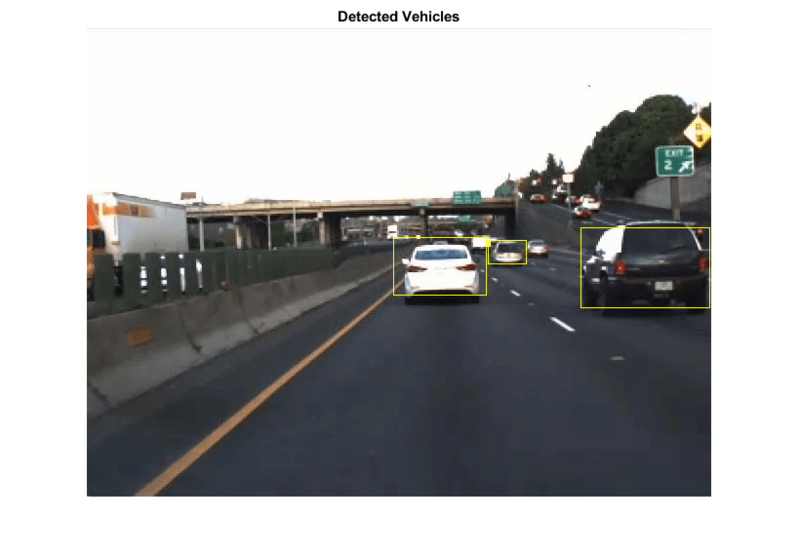 This example reuses the ACF Vehicle Detection automation algorithm to first detect vehicles and then automatically estimate the distances of the detected vehicles from the camera mounted on the ego vehicle. The algorithm then creates a label for each detected vehicle, with an attribute specifying the distance to the vehicle. First, create a vehicle detection algorithm. 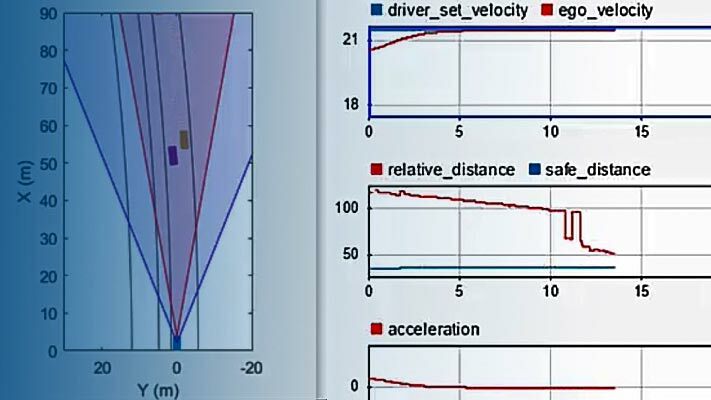 The Visual Perception Using Monocular Camera example describes how to create a pretrained vehicle detector and configure it to detect vehicle bounding boxes using the calibrated monocular camera configuration. To detect vehicles, try out the algorithm on a single video frame. % Read a frame of interest from a video. % Load the monoCamera object. % Load the pretrained detector for vehicles. % Width of a common vehicle is between 1.5 to 2.5 meters. % Detect vehicles and show the bounding boxes. Now that vehicles have been detected, estimate distances to the detected vehicles from the camera in world coordinates. monoCamera provides an imageToVehicle method to convert points from image coordinates to vehicle coordinates. This can be used to estimate the distance along the ground from the camera to the detected vehicles. The example specifies the distance as the center point of the detected vehicle, along the ground directly below it. % Find the midpoint for each bounding box in image coordinates. % Display vehicle bounding boxes and annotate them with distance in meters. Incorporate the vehicle detection and distance estimation automation class into the automation workflow of the app. See Create Automation Algorithm for Labeling (Computer Vision Toolbox) for more details. Start with the existing ACF Vehicle Detection automation algorithm to perform vehicle detection with a calibrated monocular camera. Then modify the algorithm to perform attribute automation. In this example, use the distance of the vehicle from the camera as an attribute of the detected vehicle. This section describes the steps for making changes to the existing ACF Vehicle Detection automation algorithm class. % Define algorithm Name, Description, and UserDirections. %   Character vector specifying name of algorithm. %   be assigned this variable name. %   Name of pretrained vehicle detector model. %   Monocular Camera Sensor object used to configure the detector. %   result in better detections. %   object in world units. % Supported Distance attribute name. % The label must have an attribute with the name specified. % Initialize sensor, detector and other relevant properties. % name to label the detected vehicles. % Initialize the vehicle detector with a pretrained model. % Initialize properties relevant to attribute automation. % Validate the attribute type. Step 4 contains the updated run method to compute the distance of the detected cars and writes the label and attribute info to the output labels. % Detect vehicles using the initialized vehicle detector. % Find midpoint of bottom edge of the bounding box. % Helper function to compute vehicle distance. Load the monoCamera information into the workspace. This camera sensor information is suitable for the camera used in the video used in this example, 05_highway_lanechange_25s.mp4. If you load a different video, use the sensor information appropriate for that video. In the ROI Label Definition pane on the left, click Label. Define a label with name Vehicle and type Rectangle. Optionally, add a label description. Then click OK. In the ROI Label Definition pane on the left, click Attribute. Define an attribute with name Distance, type Numeric Value, and default value 0. Optionally, add an attribute description. Then click OK. Select Algorithm > Select Algorithm > Refresh list. Select Algorithm > Vehicle Detection and Distance Estimation. If you do not see this option, ensure that the current working folder has a folder called +vision/+labeler, with a file named VehicleDetectionAndDistanceEstimation.m in it. Click Automate. A new tab opens, displaying directions for using the algorithm. Click Run. The vehicle detection and distance computation algorithm progresses through the video. Notice that the results are not satisfactory in some of the frames. Manually tweak the results by either moving the vehicle bounding box or by changing the distance value. You can also delete the bounding boxes and the associated distance values. Once you are satisfied with the vehicle bounding boxes and their distances for the entire video, click Accept. The automated vehicle detection and distance attribute labeling on the video is complete. You can now label other objects of interest and set their attributes, save the session, or export the results of this labeling run. This example showed the steps to incorporate a vehicle detection and distance attribute estimation automation algorithm into the Ground Truth Labeler app. You can extend this concept to other custom algorithms to extend the functionality of the app.